May 16: Ju Ju at Seaton ES — Teach the Beat! 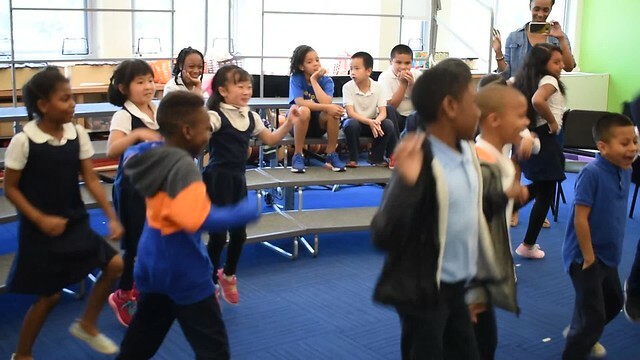 Claire Sontag’s second-grade class was joined by older students who participate in Seaton’s DC SCORES soccer program for a visit from go-go drummer Ju Ju House on May 16. Students arrived in the music room to find a child-sized drumset, Ju Ju’s roto toms, and a cowbell set out at the front of the room. Every student had the opportunity to play the instruments, with instruction from Ju Ju. Ju Ju demonstrated the difference between a go-go beat and a bounce beat, and explained that go-go was created in D.C. Finally, the children got up and danced to the beat of Ju Ju’s drumming. The following week, Ju Ju returned to Seaton for a cultural heritage celebration.